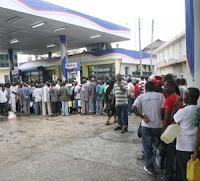 The country’s major cities came to a virtual standstill yesterday as motorists spent hours queuing for fuel at the few filling stations that still operated following the abrupt shortage of the commodity. petrol by 9.17 per cent. Many motorists were forced to park their vehicles anywhere they could and walk long distances, containers in hand, in search of the commodity that suddenly vanished in the wake of the Ewura directive. The Citizen witnessed queues of up to 100 metres in the few operating points as most of the filling stations in the country’s commercial capital had closed up shop. There was a long notable queue along Kilwa Road Oil Com filling station, stretching as far as the Kilwa Road Highway, a situation that led to heavy traffic jams. Due to the high demand of the commodity, some of the filling stations limited the amount a person could purchase to five litres. The Citizen also found out that at the Big Bon filling station in Kariakoo police had to intervene to control tensed up drivers in a hurry to buy fuel. Speaking to this newspaper, some of the motorists appealed to the government to intervene to end what they termed a boycott by the oil marketers, which, according to them, was a move that was bound to ruin the economy. Petrol station attendants in some filling stations who didn’t want their names published said they closed down business on orders from the owners. Mr Juma Ismail, a taxi driver who was at Big Bon filling station in Sinza, warned that if the situation wouldn’t return to normal by Friday (today), transportation services in the country were likely to be paralysed. “Some of the motorists have already grounded their vehicles, and do you know what that it means if the situation is not restored in the next 24 hours? There will be no cars on the roads by tomorrow. That I can guarantee you!” he said. Mr Alex Nyombo, a public servant living at Mabibo area in Dar es Salaam said he was forced to ride on a bus to the office since he failed to refill his car. However, the acting permanent secretary in the ministry of Energy and Minerals, Mr. Eliakim Maswi, told reporters that the Tanzania Association of Oil Marketing Companies (Taomac) agreed to sell fuel under the new price cap after a two-day meeting that brought together the ministry of Energy and Minerals, Ewura and the oil marketers. He added that the government took into consideration all complaints which were forwarded by Taomac during the meeting that ended yesterday. One of the complaints, according to Mr Maswi, was the 7 per cent levy, which oil-marketing companies are supposed to pay when offloading fuel at the Dar es Salaam port. He said his ministry and Ewura agreed to remove it. Taomac secretary general Salum Bisarara said that the meeting also agreed to form a committee with representatives from the ministry, Ewura and Taomac to come up with an alternative plan, which will benefit all players in the oil sector. “The services will continue while a special taskforce works on the plan,” Mr Bisarara said. However, executive director of Engen Petroleum Company, Mr Seelan Naidoo, said his company did not agree with the resolutions of the meeting because it would mean operating at a loss. Mr Naidoo threatened that Engen will cease operations in Tanzania within 24 hours if the government will continue to insist on the new price caps. In Dodoma, Prime Minister Mizengo Pinda told Parliament yesterday that Ewura, oil marketers and other relevant authorities were holding meetings aimed at reaching a consensus. In Serengeti, petrol station operators continued to sell fuel at old pump prices on the ground that their old stock, which they bought at higher prices, was not finished yet. In Mwanza, petrol stations reduced pump prices and openly displayed them since Wednesday. In Kibaha, most petrol stations continued to charge the commodity using old prices while others closed business claiming they were out of stock. In Arusha, several petrol stations remained closed yesterday as owners continued to say No to the new prices announced by Ewura. On Tuesday, Ewura executive director, Mr Haruna Masebu, announced that a litre of petrol should retail at a maximum of Sh2, 003.79, down from Sh2, 206.16, equivalent to a 9.17 drop. Diesel prices dropped by Sh173.49 per litre and would now be sold at a pump price of Sh1, 910.84 from Sh2, 084.33 – a drop of 8.31 per cent. Paraffin consumers would get a relief of Sh181.37 per litre, and would now pay Sh1, 904.53 instead of Sh2, 085.90. The new prices follow the revision of the template to determine the end price after the government reduced fuel duty in the 2011/12 Budget. The new formula also took into consideration the reduction of levies charged by several state agencies for each litre of fuel sold. The government had directed that such levies come down by 50 per cent. After consultations, Mr Masebu said yesterday, the agency reduced some levies by 51.4 per cent.